Keighley and Worth Valley Railway01535 645214work Museum - TransportThe KWVR is a heritage railway which was reopened in 1968 and runs from Keighley to Oxenhope through beautiful Brontë country. Board our steam train and enjoy the sound of the engine climbing the steep sides of the valley, while great clouds of steam and smoke add drama to the scene. The five mile journey is a powerful reminder of our industrial heritage, as well as being a unique way of enjoying the beautiful countryside immortalised by Charlotte, Emily and Anne Brontë. The Railway hosts a number of events throughout the year including two Steam Gala's and the ever popular Beer and Music Festival. You can also enjoy our evening events such as the Haworth Haddock and Keighley Korma, travel on the train and enjoy your meal before alighting at the station and dancing the night away to live bands. 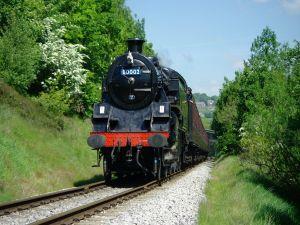 over the years, the Railway has appeared in many TV and film productions. You can visit Rail Story at Ingrow and see the engines and carriages used in these films. The KWVR is a heritage railway which was reopened in 1968 and runs from Keighley to Oxenhope through beautiful Brontë country. Board our steam train and enjoy the sound of the engine climbing the steep sides of the valley, while great clouds of steam and smoke add drama to the scene. The five mile journey is a powerful reminder of our industrial heritage, as well as being a unique way of enjoying the beautiful countryside immortalised by Charlotte, Emily and Anne Brontë. The Railway really does have something for everyone so why not come and visit us! Services operate weekends all year and school holidays. Services also operate on selected Wednesdays and on special event dates throughout the year. Please see the website for full timetable information. Family Day Rover: £40. This ticket is the same as the Day Rover, although is ideal for Families and Small Groups travelling together. Valid for 2 Adults and up to 3 Children or Concessions. (eg - 2 adults + 1 child + 1 OAP). Line return, concession fares, student rates & Local resident reductions available.